A public outreach and educational site. Around 1,000 BC when Woodland period ceramics make their first appearance at the Kolb site, lifeways began to change in terms of subsistence, mobility, and settlement. By 3000 years ago pottery began to spread and be made into numerous different forms tempered with a variety of materials including, sand, crushed stone, crushed pottery fragments known as grog (typical of the Hanover phase) and pulverized sandstone. Vessels surfaces are decorated with an ever increasing number of techniques including check stamped designs carved into a wooden paddle and applied to the outer surface of vessels in a process to meld together coils. Other decorations include cord marked, fabric impressed, finger pinched, and others. There is a good occupation at Kolb during the Late Woodland represented by large pits some of which were ultimately filled with refuse including freshwater mussel shells. The calcium carbonate in the shell allows for animal bones to preserve in the ground that would otherwise have rotted away long ago. The bow and arrow were introduced and the first small triangular shaped points make their appearance in the archaeological record. Numerous examples have been recovered from the Kolb site, the majority of which are made out of rhyolite. Evidence of horticultural activities was preserved at the Pumpkin site in the Piedmont region of South Carolina, where goosefoot and maygrass seeds–oily starchy grains, point towards human manipulation of natural species. We hope to analyze soil samples to understand the ethnobotany of Kolb site at a future date. Thanks to our colleague Dawn Reid, we are beginning to learn a great deal about the animals and fish utilized as food resources. By the time of the Hanover phase occupation ca 675AD, the occupants of the Kolb site exploited a wide range of animals for food. Animal bones identified from feature contexts include deer, raccoon, rabbit, turkey, turtle, and fish. Three different types of turtles are present in the collection. Many of the turtle bones are burned, indicating that they were likely brought to the site and cooked. A large percentage of the bones are burned, indicating cooking and the likely burning of food debris probably to keep scavengers away. Fish bones are the most common and over 5,000 have been identified in the assemblage. These bones represent bass, trout, perch, carp, gar, catfish, and bowfin. In general, all of these fish prefer slow moving water such as pools or backwaters and all would have been available in the stream/river beside the Kolb site. The fish in the site assemblage all spawn during the spring and the young will school among weeds or in still waters. These settings are called nursery areas. Interestingly, the size range of the fish bones suggests that immature fish were being focused on. These fish would have been too small to catch with hooks and would have had to have been either trapped or scooped up with baskets or nets. Although we infrequently find such implements preserved at archaeological sites, we can infer their presence based on the presence of these very small fish. A large number of small fish could provide a filling meal if boiled, which would result in a cluster of the small bones to collected in the bottom of the pot. This cluster of bones would then presumably be emptied into a refuse pit where we recover them. The number of immature fish in this collection also tells us that the site was likely occupied during the summer, after spawning but before the fish matured and moved out of the nursery areas. Finally, the bone assemblage from the Kolb site contains numerous snakes and frogs. These animals were probably not eaten but were visitors to the site area and died naturally. Snakes and frogs are attracted to disturbed soils, such as would be the result of digging of a debris pit. Polished stone gorgets, drilled for suspension and often notched along the edges suggests a non-utilitarian personal adornment function. Such items indicate the possibility of emerging social classes. 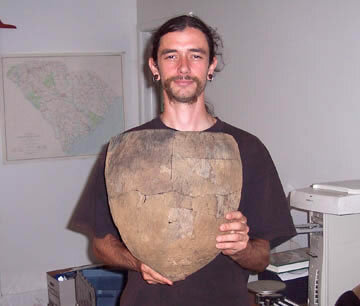 One such gorget was recovered at the Kolb site in 2006. Alternate interpretations include wrist protectors for archers or they may have been fitted with cordage and twirled like a bull-roarer. Another sign of emerging social class are the low, conical, sand burial mounds appear on the southern coast of South Carolina while multiple individuals are buried in ossuaries on the northern coast. At least one ossuary is located in the Little Pee Dee River drainage. Woodland burial mounds also occur in the coastal plain of North Carolina. With the economy lagging and pressure on state government to spend less on discretionary programs our usual funding sources are drying up, and we are forced to ask for contributions. For the field season we need money for food, transportation and supplies. Our demonstrators charge us a minimal fee that covers their transportation and supplies. After fieldwork is over the artifacts need to be washed, cataloged and stored. It all adds up. If you can help, we will appreciate it. Work at the Kolb Site has been made possible by the generous contributions of private parties, grants, volunteer workers, and the communities of Mechanicsville and Society Hill, South Carolina. To make your donation to the Kolb site, e-mail Diachronic@aol.com, send a check to PO Box 50394, Columbia SC 29250.